Dumplings – one of the most popular Russian dishes. They can be cooked not only using the stove. Fast and delicious, they can also cook in a microwave oven. In terms of quality dumplings, cooked in the microwave, not inferior cooked in the traditional way. The easiest way is to take a pack of frozen store-bought dumplings and cook it. This will clean the roots and carrots. Cut them into slices. Peel the onion and cut it in half. Put all into a deep pot of cold water. Add pepper, salt, Bay leaf, cover the container with a lid (instead of the cover you can use an inverted plate or foil). When furnace 100% bring the water to a boil. It will take 4 minutes. Put in boiling water dumplings and cook them for about 2 minutes at the same power to the ascent. The finished product, remove from broth, place on plates, season with butter and mayonnaise, sprinkle with herbs. Dumplings can blind yourself, and then cook them in the microwave. To cook meat dumplings, peel the onion and cut it into several pieces. Meat cut into pieces and pass it through a meat grinder together with onion. Add to meat mixture salt, pepper and knead. Prepare the dough from flour, eggs and water. Shape the dumplings. Boil in the microwave salted cold water at a power of 100%. Put in her dumplings and cook them in the furnace 40% for 6 minutes. Dumplings should float. In the process of cooking stir the product 2 times. The finished dumplings put on a plate, decorate with parsley and chopped green onions. In a microwave oven, you can cook dumplings with fish. From flour, water and eggs and knead tight dough. Miss the fish fillet with onions through a meat grinder a couple of times. Add butter, salt, pepper. Shape the dumplings. With the power of a microwave oven 100% salted water on to boil. Dumplings cook for 4 minutes at the same power to the ascent. The finished product will be well to fill soy sauce. 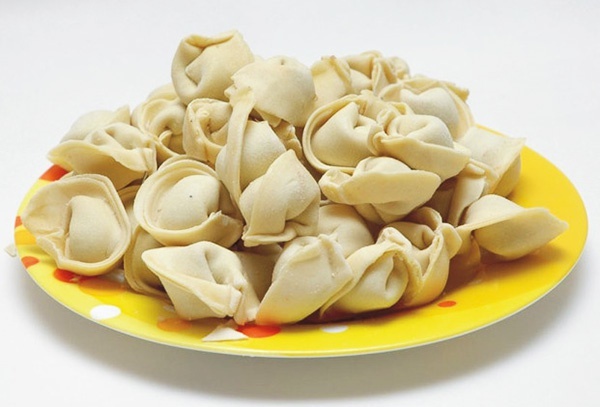 Quickly boil them in the microwave dumplings with mushrooms. To prepare this dish, soak the mushrooms for 2 hours in cold water, then finely chop them. Boil the water, which soaked mushrooms in a microwave oven at a power of 100%. Throw in a container of water to the mushrooms and cook them for about 9 minutes at the same power until soft. Allow the mushrooms to stand, covered for 5 minutes, then drain the liquid and mix the product with the finely chopped onion. Add the oil mixture and fry it in the microwave 3 minutes at full power. Add cooked rice, salt, pepper. Knead a dough from water, flour and eggs. Shape the dumplings. Boil in the microwave in salt water (100% power). Dumplings cook at the same power 4 minutes before surfacing. The finished dish pour sour cream. Pour the dumplings already hot water from the kettle (grudem boiling water) to prevent sticking and microwave on high , for 10 minutes. For one serving you will need about 15 large dumplings. When you add salt, remember that you only have half a glass of water, not a whole pot, and don't overdo it. Most likely, a glass of water will not be able to make all the dumplings, but this is not necessary. In this case, your dumplings will be like steamed.